The hugely hyped and highly anticipated film, BLACK PANTHER, has finally been released and Hong Kong got it three days before most of the rest of the world did. Directed by Ryan Coogler (FRUITVALE STATION; CREED), this latest MARVEL entry stars a who’s who of African-American and Black British actors along with a couple of Tolkien white guys (not my joke but too good to pass up), including Chadwick Boseman (42) in the title role, Michael B. Jordan (CREED) and his fabulous dread-cut, Oscar winner Lupita Nyong’o (STAR WARS: THE LAST JEDI), Danai Gurira (TV’s THE WALKING DEAD), Daniel Kaluuya (GET OUT), Emmy winner Sterling K. Brown (TV’s THIS IS US), Oscar winner Forest Whitaker (ARRIVAL; LEE DANIELS’ THE BUTLER), and Angela Bassett (HOW STELLA GOT HER GROOVE BACK). BLACK PANTHER provides MARVEL Universe fans with the character’s origin story in preparation for his expanded role in the upcoming AVENGERS: INFINITY WAR. Without revealing too much here, the film opens with a bit of history. Eons ago, a meteor hit the central African country of Wakanda, depositing a vibration-absorbing mineral called vibranium there. The king, realising that the outside world would want to exploit his country for this valuable resource, made the decision to keep the mineral’s existence secret. As a result, even today, the world believes that Wakanda is a poor Third World country. A certain American president might even call it a “shithole” but he would be wrong because, buried deep inside a mountain, the real Wakanda is a technological powerhouse with inventions and innovations that make Tony Stark’s gadgets and gizmos look like Tinkertoys. After T’Challa’s (Boseman) father, King T’Chaka gets killed (that’s not a spoiler because it happened in CAPTAIN AMERICA: CIVIL WAR), T’Challa ascends to the throne but not before beating off a challenger from one of the five tribes of Wakanda. His early days as king are anything but boring as South African black marketeer Ulysses Klaue (a wonderful Andy Sirkis, WAR FOR THE PLANET OF THE APES) steals an ancient artifact that he knows is made from vibranium. With the help of CIA agent Everett Ross (Martin Freeman, the LOTR trilogy), T’Challa captures Klaue only to lose him to Erik Killmonger (Jordan), who has a much bigger agenda than just taking possession of a piece of alien metal. 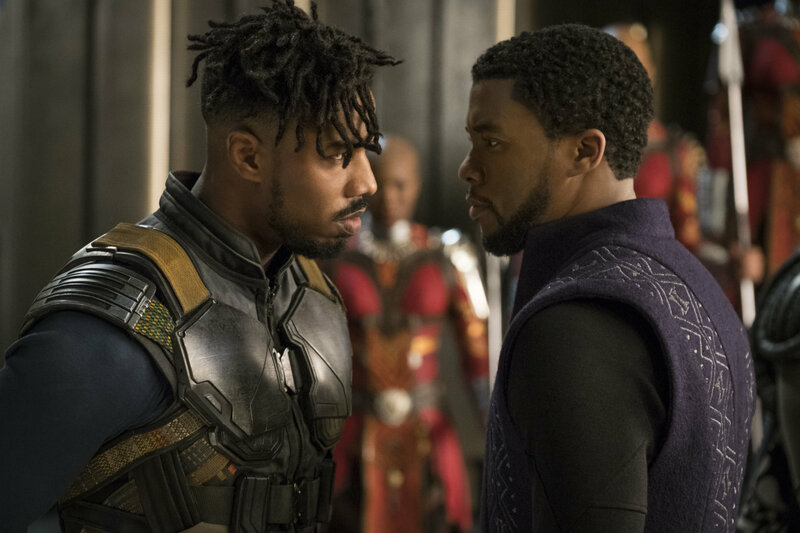 This puts T’Challa on a collision course with Killmonger that could have immediate consequences not only for the future of Wakanda but for the whole world. There is a whole lot that’s good about BLACK PANTHER and only a couple of things that aren’t so good. For the good, there are more than a few great performances here, starting with Boseman and Jordan but certainly not ending with them. Wakandan women rock and rule! Gurira is absolutely fierce as General Okoye, the head of the Dora Milaje, Wakanda’s all-female army; Bassett is resplendent as Ramonda, the Queen Mother; and Nyong’o oozes with elegance and attitude as Nakia, T’Challa’s ex-girlfriend who is also a Wakandan spy. It’s Letitia Wright, though, who steals the film from all of them as Shuri, T’Challa’s ultra-cool, 16-year-old sister. Shuri, who could teach James Bond’s Q a thing or two about technology, will most certainly be held up as a model for young girls everywhere to study STEM subjects at school and rightly so. I understand she’ll be seen in the upcoming AVENGERS: INFINITY WAR and if the film’s writers haven’t already re-written her scenes with Tony Stark, they’d better get cracking! Also good are the costumes, which have one foot firmly planted in traditional Africa and the other in the future. Without revealing anything, I’ll just say that the Wakandan fabric weavers have taken multifunctionality to a whole new level! Where the film loses points is with the pacing. Like most MARVEL films, it’s about 30 minutes too long. A couple of scenes drag and perhaps should have been left on the cutting room floor altogether. The film also spends slightly too much time on T’Challa’s support group (granted, they’re all wonderful) and not enough time on him. It may be that there isn’t that much to tell about his character and, if that’s the case, then he’s possibly the least conflicted superhero in the MARVEL Universe. On the other hand, the car chase scene between the Black Panther and Klaue is pure comic book awesomeness. I could have watched a few more minutes of that. Another downer was that Coogler and fellow screenwriter Joe Robert Cole didn’t quite stick to the MARVEL handbook. The story definitely waded into non-MARVEL territory with elements from the Bond, STAR WARS and even TRANSFORMERS films popping up throughout. All in all, though, BLACK PANTHER is a fun and often times funny film, and a great way to spend a couple of hours. The boys and girls at DC/Warner Bros are probably kicking themselves all over again wondering how they keep getting their franchise so wrong while MARVEL/Disney keep getting theirs so right. I saw the film in IMAX 3D and, once again, I was less than impressed with that format. Save your money and watch it either in regular 2D or in IMAX 2D. The 3D effect just cuts out far too much light. Watch the review recorded on Facebook Live in RTHK Radio 4’s studio on Thursday, February 15th at 8:30 am HK time!